Adobe Creative Cloud or Adobe CC is their latest version of their software package. Which has a large option of programs but comes at a high subscription fee. In 2014 I bought a hard copy of Adobe CS6. It was from an online retailer and was shipped to my house. The software came in the official looking package as well as a serial number. Also, I used this software for over three years no problems. 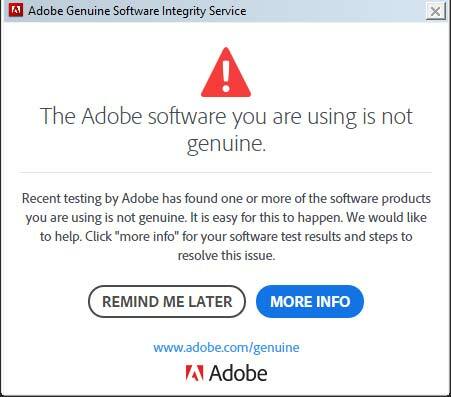 Recently, probably for the past month or so I started receiving a not genuine Adobe product warning pop up every fifteen minutes or so. This seemed very odd, considering I have been using the software for three years no problem. So I immediately started researching the problem on the internet. The main solution that seemed to come up was to re-install your software. I uninstalled my copy of CS6 and reinstalled, but this time the serial number would not work at all. Of course, I contacted Adobe about the matter. Come to find out the copy I have has a fake serial number. I could not find the receipt email or remember what site I bought it from so unless I upgrade there was no way to use my software I purchased. One might argue that this is a big push by Adobe to get everyone to upgrade to Adobe Creative Cloud. So unless you have all your proper paperwork, which I did not, you have no ground to stand on. Because of my software situation, I was forced to upgrade. The programs for Adobe Creative Cloud are outstanding, nobody ever argues that. It is the ongoing price that is tough to swallow. As a web developer or any other type of graphic artist, there are some programs you can not live without. Of course on top of that list is Photoshop, usually followed by Illustrator, Dreamweaver and for the video guys, After Effects. All of these are included in the full subscription package. Customer support offered me a discounted rate at $29.99 a month. Not too bad but not great either. Here is the rub, after the first year, it goes up to $49.99 a month. It really is a shame about the price, there are some great programs and even new ones like Experience Design (like Sketch for Mac) and Character Animator that are really cool. As I have a year discounted, I will research other programs to use in place of Adobe. I recently started researching CorelDraw and will report back with my findings. If any of you out there know of alternatives let us know in the comments below. If you need help designing or marketing your website give us a call at 734-729-7082 or contact us today!